Marriage is a huge life decision. 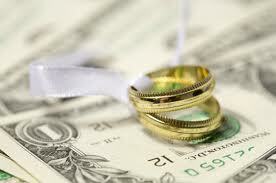 Your marriage will affect all aspects of your life, including your finances. Before you get married, you need to have a financial show and tell. Be honest about your debts and where you stand. Your partner should also be forthcoming about his or her finances. Get it all out there on the table so that you can see what your combined finances could look like. Once it’s out there, you can also get a good idea of where you need to go from there. Seeing the big picture can help you figure out how to improve your finances and make a plan for achieving your shared goals. Next, you need to make sure that you have some shared financial priorities. What are the things you want to accomplish together? Do you want to buy a home? Have children? Save for retirement? Use your money to travel the world? Give to charity? If you start spending, and you have different priorities, one (or both) of you is going to be very unhappy if you are unwilling to compromise. When you aren’t spending money on the things that are important to you, it starts to feel as though you are “wasting” your money — and no one likes that feeling. Make sure that you come up with shared financial priorities, and that on items that you differ on, you come up with a way to ensure that both partners are able to spend money on what’s most important to each. My husband and I didn’t have what many would consider a “real” honeymoon. We spent a couple of days in New York City. However, our honeymoon was very affordable. There are some that recommend you choose a honeymoon that you can pay off within a year. I prefer to save up for a honeymoon. Since my husband and I had something of a whirlwind romance, there was no time to save up for a grand vacation. And we had to be back at school a week later anyway. Don’t plan a honeymoon that you will both regret as you continue to pay for it year after year. The same is true of your wedding. If you know that both of you won’t mind paying for the wedding and honeymoon for the next five years, then go all out. But you have to agree that it’s something you both feel is worth going into debt for, and worth paying all the interest on. Work together to create a spending plan that works for your situation. If you have separate accounts, you need to figure out who will pay what bills. Should you set up a joint account and each of you contribute money to the account to cover shared expenses? Also, figure out how much you can afford to spend on groceries, entertainment, and other items. Look at your income and your expenses, and note recurring costs like insurance premiums, housing payments, and retirement account contributions. You will also need to find out about obligations your partner has (and share yours). While debt is an obvious obligation, your spending plan will also need to take into account the possibility of child support and alimony. You don’t have to be responsible for your new spouse’s debt. But you have to be careful to keep it separate. Debt incurred before the marriage only becomes your responsibility (in most cases — check your state law) if you are added to the account, or if you co-sign to refinance the debt. Think long and hard before you take on your spouse’s debt. You might find that it makes more sense to encourage your spouse to carry on with paying down his or her own debts. What other tips can you think of for starting a marriage out on the right financial foot? I have a feeling that when you are young and in love it is often hard to be honest about priorities. In fact, it is often hard to know your priorities. I feel that when the preacher says “and the 2 shall become 1” that includes finances. The idea of separate accounts is so foreign to me. My wife and I communicate openly about our finances and financial goals. Each month we create a spending plan specific to that month and then we follow that plan. Should one of us get off the plan, the other one gets to call them on it. We visit weekly about our spending plan making sure we’re doing the things that we want to do. With money being the #1 cause of divorce in North America I don’t want to be anywhere close to not being on the same page as my spouse with our finances. Great points for new couples. I especially like that you use the term Spending Plan not Budget, which everyone hates! These are very good points for newly-weds. Some points can also benefit couples that have been married for so long. Honesty about financial matters and spending plans are vital techniques to adopt. For those who have just been married, a simple honeymoon is also advisable. Some great tips here but I think most couples just don’t consider the financial side. Love is blind! Comment on tip number 5 – Taking on your spouses debt. My wife and I both brought some consumer debt into the relationship, she brought in significantly more then myself. We decided that our main financial objective was to get rid of that consumer debt. With that, we consolidated and hammered it down. $45,000 (plus savings for a destination wedding and honeymoon) were paid off in just over a year. We walked away from our wedding and honeymoon debt free. Had we kept our debt separate my wife, who had more debt and earns less, would still be trying to pay it off to this day. Instead we have a new financial future in front of us with considerably less stress, stronger common financial goals, greater responsibility and accountability to our finances, and 2 years later, over $30,000 in the bank (and growing every month) waiting for an investment opportunity. I understand your point on keeping things separate but there definitely advantages to working together. It requires both partners to be honest with themselves and realize that it is not “your debt” and “my income”, if the the idea of being on the same financial team is important then an attitude of it is “our debt” and “our income”. My wife does struggle with that concept at times but treating all household income as one and all expenses as one paved the way for us to talk as a team about our finances.